York Cemetery was opened in 1837 and went into voluntary liquidation in 1966. The liquidation took thirteen years during which time all that could be disposed of for profit was sold. Sadly, nobody was interested in running the site and it devolved to the Crown. All rights of burial and access to the site were lost. 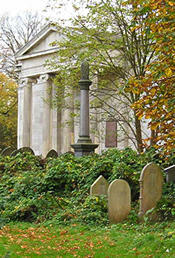 Over the liquidation period, the Cemetery became a derelict wilderness and its buildings decayed, the collapse of the roof of the Grade II* listed neo-classical chapel in August 1984 being the final act in the drama. This was the point at which a group of concerned York citizens decided that steps had to be taken to retrieve the situation and formed The Friends of York Cemetery and then York Cemetery Trust. York Cemetery is proud of its Grade II* listed chapel, which places it amongst the 6% most important listed buildings in the United Kingdom. In addition, the Gatehouse, part of the wrought iron boundary fence, and six monuments are Grade II listed. Located just inside the main gates on Cemetery Road, the gatehouse houses the cemetery office and is the first point of inquiry for most cemetery visitors. A bit further up the curving driveway, the chapel has always been a focal point within the cemetery. 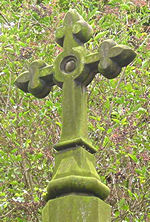 It was designed by the architect James Piggot Pritchett as a part of the original cemetery landscape. Pritchett based his design on the temple of Erectheus in Athens. 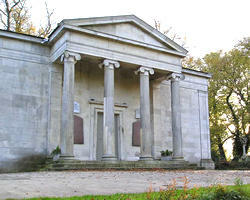 Completed in 1838, the chapel is an excellent example of the late neo-classical style and is considered to be one of Pritchett’s most successful commissions. Interment in the catacombs was offered as soon as the building was completed. However, this was relatively expensive and not very popular – only 17 people were interred here, the last in August 1881. In June 1966, liquidators began to wind up the affairs of the cemetery company, which had been in decline since the 1940s. By 1979, nothing of any commercial value was left, and with no person or institution interested in taking it over, the cemetery devolved to the Crown. The grounds and the two listed buildings were abandoned, and the chapel continued to deteriorate and be the target of vandals. In July 1984, the roof of the chapel finally collapsed, bringing down part of the back wall. This single event stimulated a group of local people to take action, which led to the formation of York Cemetery Trust, who became the owners of the new freehold of the whole site in February 1987. Restoration began with the aid of grants and donations from many sources. The chapel came to new life when, after being left derelict for many years in the last century, it was restored once the Trustees took over the site in the late 1980s.